Do you know that the thing called ‘Carbohydrate Withdrawal Syndrome’ is for real? Some people call it ‘Low Carb Flu’ and it can be a really annoying thing to deal with. For example, whenever I (dramatically) stop eating rice to cut down carbs I start having withdrawal syndromes like headaches, crankiness, and a constant craving for rice. You might have felt it as well after withdrawing foods like pasta, potatoes or anything starchy from your diet and it can really get exhausting. In my case, it is always ‘rice’. This is one thing I can’t do without. 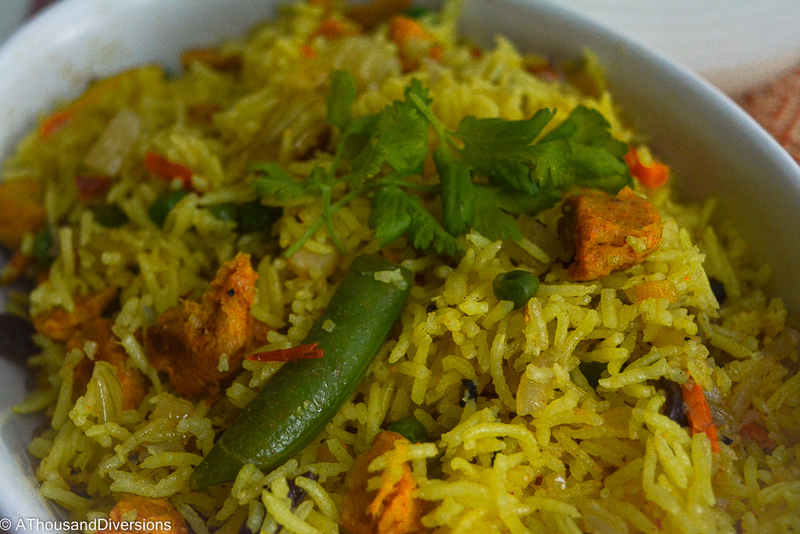 So whenever the crankiness makes a visit, I rustle up some easy and healthy rice dishes to prevent it. It doesn’t always have to be greasy and unhealthy. Here’s one dish I make to keep the carb intact balanced. This dish is not only full of vegetables but also full of protein as I add soya chunks to make it more healthy. Although we Indians can’t do without our spices, I try to keep their use to the minimum. If you too are feeling something like ‘low carb flu’ or simply craving for some Indian food, here’s how to make this non-spicy version. Soak the rice in cold water for half an hour. Soak the soy chunks in hot water for 15-20 mins. Boil the rice with one cardamom, one clove (crushed together), and a pinch of cinnamon. Add the turmeric to get a beautiful yellow colour. Turmeric has antiseptic properties and it is always better than using artificial colours. Add a few drops of oil to prevent the rice from sticking to one another. Or you can add a few drops of lemon. Boil the rice with lots of water so you can drain the excess carbohydrate along with the excess water after the rice looks cooked. Squeeze the water from the soya chunks and cut them in halves. Chop the onion, all the vegetables, and the green chili you want to add. Keep the heat low and add onion and ginger-garlic paste along with the chopped green chili. Fry for 2 minutes. Add soy sauce, salt, and sugar. Cover with the lead and let it cook for 10 mins. Keep checking from time to time. If the soya chunks look dry add a teaspoon of butter. Once the soya chunks look golden and cooked add the vegetables and the raisins. Cover with the lid again and cook for another 10 mins. You can add other spices like cumin and coriander powders but I haven’t used any of them in this recipe. Once the vegetables and the soya chunks look done bring the heat to low again. Slowly add the boiled rice and mix well. Check the salt and add more if required. Cook for 2 mins and turn off the heat. Add coriander leaves for the extra fragrance and flavour. This recipe serves 3 people. Serve it with raita which is a yoghurt sauce made with yoghurt lightened with water and then mixed with finely cucumber and onion. Add salt, sugar, crushed black pepper, and cumin seeds for taste. This helps in digestion as well balances the spicy flavours. Hope you enjoy trying this dish. Do you also feel carbohydrate withdrawal syndromes from time to time? Let me know how you choose to treat it. Looking so yummy. Definitely going to try. Hi….. 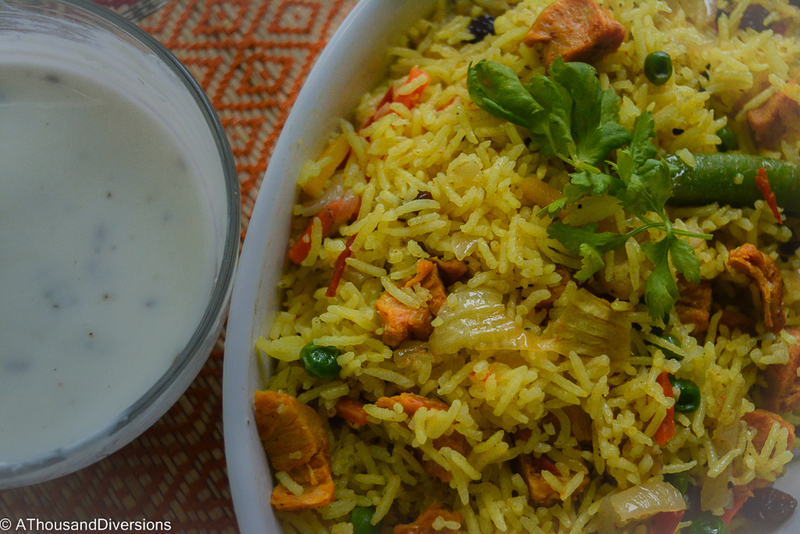 Very yummmmmilicious recipe… Thank you… Would like to share a rice recipe with you….whenever you have leftover daal vegetables make this recipe.. Put oil in a pan add cumin seeds let them splatter along with cloves big cardamom cinnamon stick, add onions chopped lengthwise tomato puree & tomato ketchup to this with the leftover daal & vegetables. Add the boiled rice salt chilli powder jeera & coriander powder. Kasuri methi & cover & cook on low flame till all the ingredients mix up in the rice. 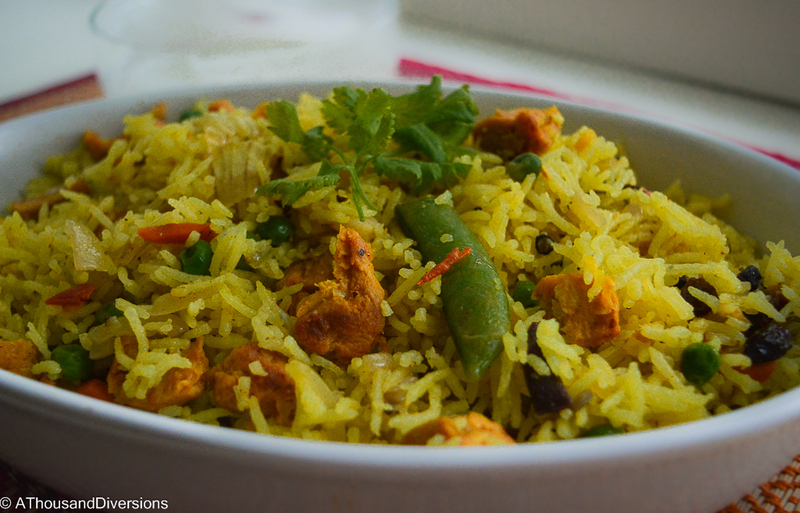 To enrich this you can add paneer or Soya chunks too…!